 Measurements of the incoming and outgoing bandwidth.  Measurements of the bandwidth used by individual IP addresses.  Measurements of the bandwidth used by individual applications.  Measurements of bandwidth across external interfaces, or bridges, or both.  Drill down through the report from application bandwidth into IP address bandwidth, and vice versa.  Application classification into groups, and bandwidth measurements of these groups. For a detailed description of each application grouping, see Standard Smoothwall Application Groups and Deep Packet Inspection Application Groups. Note: A Layer 7 licence (deep packet inspection) is required to run this report fully. Without this licence, limited information is available. For more information about obtaining a Layer 7 licence, refer to your Smoothwall representative. To run the report for a specific traffic direction and interface, click the Advanced >> button and choose the traffic direction from the Data flow direction to highlight drop down list, and interface from the Interface drop down list. Enter the required date range and click Run report.  Traffic statistics — Shows the incoming and outgoing bandwidth as a graph, over the specified date range.  Top 5 IP addresses over time — Shows the bandwidth used, as a graph, for each of the top five IP address. Incoming or outgoing data is shown, dependant on the traffic direction chosen when running the report. 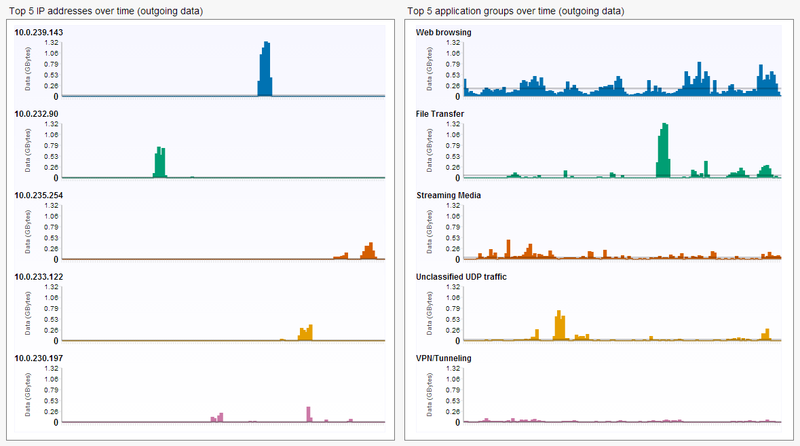  Top 5 application groups over time — Shows the bandwidth used, as a graph, for each of the top five application groups. Incoming or outgoing data is shown, dependant on the traffic direction chosen when running the report. Note: Note that as you drill down through the report, the Traffic statistics graph is always displayed at the top.